Last week SteamForged previewed Claire Redfield and Leon S. Kennedy, and discussed how their special abilities were designed to help them feel characterful and unique during gameplay. If you missed out, don’t worry – you can find it here. At the end of that article, they finished up by briefly mentioning the different weapons available to the characters, and today we’re going to continue by talking about some of them in a little more detail. As any Resident Evil 2 veteran will tell you, there is a wide variety of weaponry to be found in the original video game, and SFG are taking great care to replicate each weapon for the Board Game. From the simple Knife to the mighty and yet somewhat messy Rocket Launcher. Each weapon is being designed to be not only unique, but to offer players a different application. In the original video game, players loaded up for individual enemies with different weapons, and playing Resident Evil™ 2: Board Game is planned to be no different. Sure, you can use the Magnum to kill a zombie with maximum effect – but it still feels like a waste of good ammo, especially when you unexpectedly encounter a Licker in the next room! The Handgun is the staple weapon of the original RE2 video game, and you probably won’t be surprised to learn that this is also true of the Resident Evil™ 2: Board Game. Blessed with a large ammunition track and useable by nearly every character in the game, the Handgun is a versatile weapon which is only limited by its relative lack of stopping power. One of the things that makes the Handgun so interesting however, is how it can be used to attack. 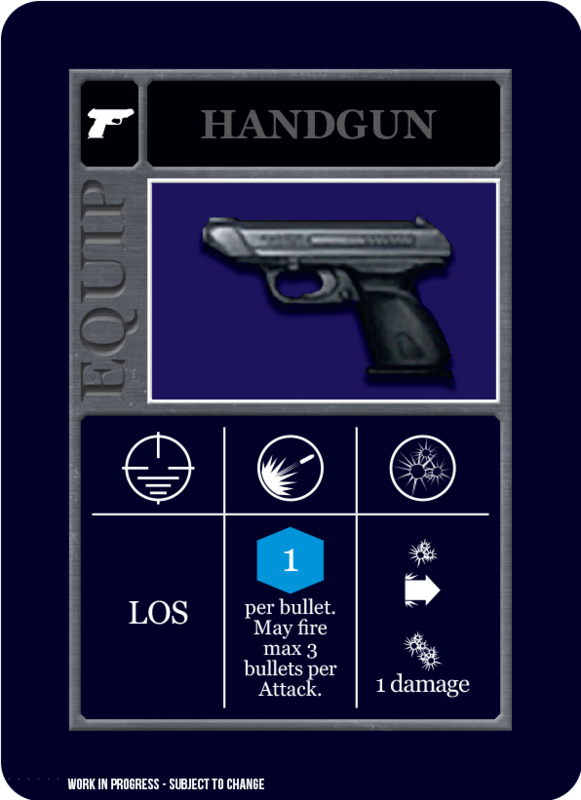 In the Resident Evil™ 2: Board Game, the Handgun is a weapon which typifies the resource management approach which existed within the original game. When a character makes an attack with the Handgun, their player has to choose how many bullets they’re firing, to represent the amount of shots they’re putting into the enemy lurching towards them – but because the player chooses before rolling the Attack Dice, this often presents a difficult dilemma. 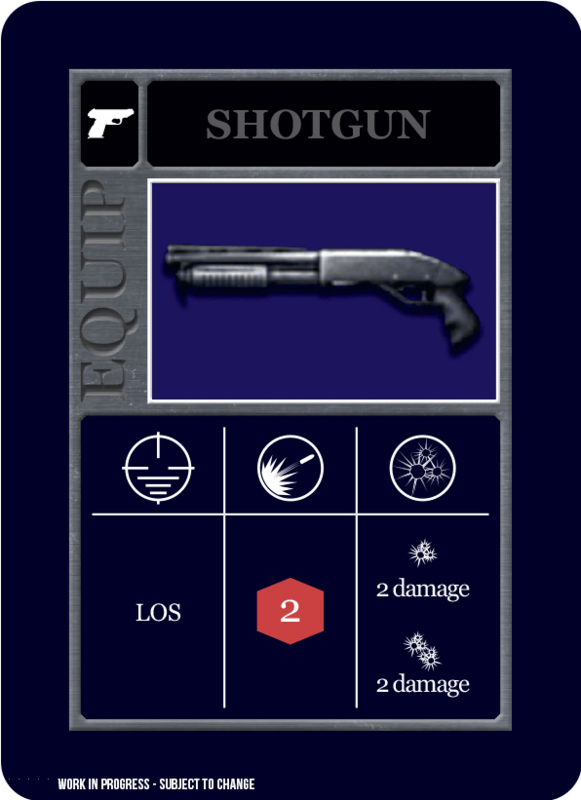 Another series mainstay, and fan favourite, the heavy and cumbersome Shotgun with a reduced ammunition track but a bit more poke, several of the characters in the Resident Evil™ 2: Board Game are unable to use the Shotgun due to its recoil and weight – but what the Shotgun lacks in subtlety and versatility it certainly makes up in power! The first taste of a weapon which significantly upgrades damage, the Shotgun will be essential to players throughout most of the game. The biggest difference between the Shotgun and the Handgun is that a successful hit won’t ever push enemies back – if the dice come up with hits, it’s all damage. This can be devastating against enemies like Zombies or Zombie Dogs, but dare you waste the ammo instead of saving it for a larger, and more dangerous target? Another weapon that will be with players from early on in the game, the Bowgun is much like the Shotgun in that its complexity limits the amount of characters who can use it. On the surface, the Bowgun could easily be regarded as a solid upgrade for the Handgun, but let’s not jump to conclusions just yet – see those two little icons we’ve highlighted? They’re a hint that the Bowgun has been designed with something a little different in mind. The first is the Stackable icon. 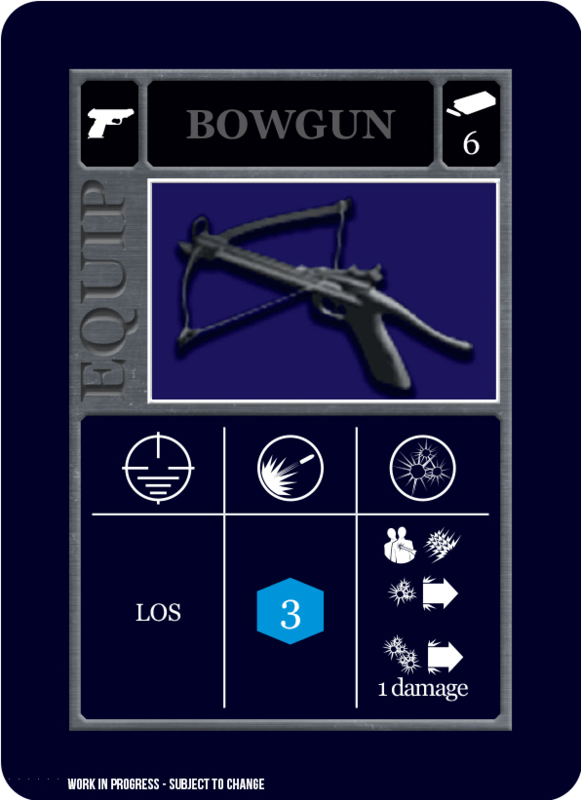 The Bowgun is the first weapon which players will encounter with this rule, which means that players total up the hits from an attack made with this weapon instead of choosing only one result. The second is the Distribute icon, which means that these hits can be spread throughout any available targets in the same square, as long as at least one hit is allocated to the original target. As you can imagine, this makes the weapon extremely versatile. After rolling their Attack Dice, players can either damage or push several enemies back – or cause damage and an extended push to a single, more dangerous enemy! Of course, astute observers will point out that weapons are only useful whilst they have ammunition, and that couldn’t be more true, unless you’re about to embark on a ‘Knife Only’ challenge. Just like in the original video game, Ammunition Items are few and far between, so players will want to be sparing with their weapons.